Last week we had the pleasure of sampling the Smokestack Series from Boulevard Brewing Company. This brewery, while well-known in some parts of the country, is just beginning to make its way to Southern Oregon, so I was quite excited to sample their beers. Because my sour beer palate has finally begun to develop, I was particularly looking forward to their Saison-Brett, which is not the same as the Saison listed on their website. We also had their Double-Wide IPA, Long Strange Tripel, and Sixth Glass Quadrupel to sample. All four of these beers came in 750mL basket-corked bottles. The one thing that struck me as curious about all four of these beers was the style of carbonation. I was able to pull a nice head on each beer, but never anything thick and meringue-like, and neither did they have the champagne effervescence of, say, Meantime London Porter. We tried the IPA first, and it poured a cloudy, unfiltered gold with a nice off-white head. It struck me that it had sort of an old malt flavor, probably indicative of a little bit of age, and strongly astringent hops. It was not as hoppy as a Pacific Northwest IPA, and had a nice complexity to it. But I am not much of an IPA guy, and was eager to move on to the other three beers. Next was the Saison-Brett, second because I figured the sourness from the brettanomyces would help cleanse the palate for the two high-gravity Belgian styles to follow. This beer, at 8.5% ABV, poured again a very cloudy gold, but with a very thin and almost no head. It displayed tiny, tiny bubbles in the glass and hinted at peaches and other pit fruits in the nose. It smelled very estery. 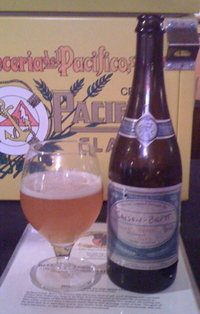 On the palate, the sour notes were very weak, as was the rest of the body. I expected more from this saison, I guess. I noted in my book that it was "missing the funk." However, saisons are a broad category and can take on many different forms, so I'm sure this guy matches somebody's palate out there. It's certainly worth trying. Our third beer was the Long Strange Tripel, which as you can see from the photo poured with a nice, foamy, thick head that appeared to be almost yellow. The color doesn't come across well in the photo. However, just moments after that picture was taken, the head had collapsed to less than a finger in height, leaving just a bit of lacing around the glass. This beer was dark gold and remarkably clear. It smelled of alcohol and ginger bread, and presented a fairly effervescent body with hints of sourness, lots of fruit, and a touch of booze. It was very tasty, though perhaps a bit too hoppy for a tripel. The fourth and last beer from Boulevard was The Sixth Glass, a quadrupel. This is a challenging style---challenging and delicious. I haven't written much about them, but I sure do enjoy those extreme, malty monsters from Belgium. I was really looking forward to this. The Sixth Glass poured a translucent brown with a big tan-white head that vanished right away. There was a lot of heat and sweetness on the nose, with hints of dates and maybe a bit of plum. It had a good body, but the 10.5% ABV made itself all too known. The beer was hot, with a whiskey-like aftertaste and big malt flavors throughout. Surprisingly, though the head vanished quickly, the beer managed to maintain its effervescent body. Overall, the Smokestack Series was an interesting drinking experience. My favorites were easily the Long Strange Tripel and Sixth Glass Quadrupel, but I would also love to try their usual Saison offering, so I shall keep an eye out for it. Are these beers worth trying? If you have never sampled anything from Boulevard before, then most certainly. This page contains a single entry by Erik Arneson published on April 20, 2010 7:51 AM. Firestone Walker Double Barrel Ale (DBA) was the previous entry in this blog. Vista de Cuba by Oliveros is the next entry in this blog.